It looks like something out of Jules Verne. 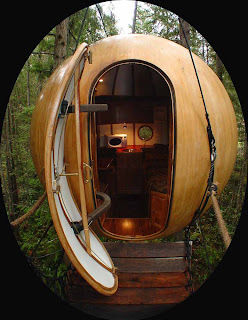 Free Spirit Spheres build lovely, spherical wooden treehouses that you enter via a suspension bridge. The photo-gallery documents the construction and installation of "Eryn," a five-windowed spherical tree-dwelling with an electric kitchen, sleeping area, and living area.